Scottish OCCA’s legendary Burns Supper is an event not to be missed and an important part of our social calendar. The alliance with Scottish SDC, to form the ‘Scottish Colour and Coatings Group’, has not diminished the enthusiasm for a good night out. Regular visitors to the Burns Supper will be familiar with the ‘Order of Events’ which usually commences with a wee ‘dram’ in the bar before sitting down to a traditional Scottish meal, including the piping of the Haggis, various renderings of Burn’s very own music, songs and verse and a ‘Toast to the Lassies’. Our Burns Supper is no longer a ‘male only’ affair. Nowadays, ladies are welcomed. Indeed we encourage them to attend our Burns Supper. As in previous years, there will be a ‘Response from the Lassies’ during the evening's events. Join us and make this another memorable & fun occasion. See for yourself, (if you do not already know), what a good value, traditional and cultured evening our Burns Supper is. Ticket price £65 (incl. VAT). Bed & Breakfast is offered at £50 single occupancy, £60 for a double/twin room. 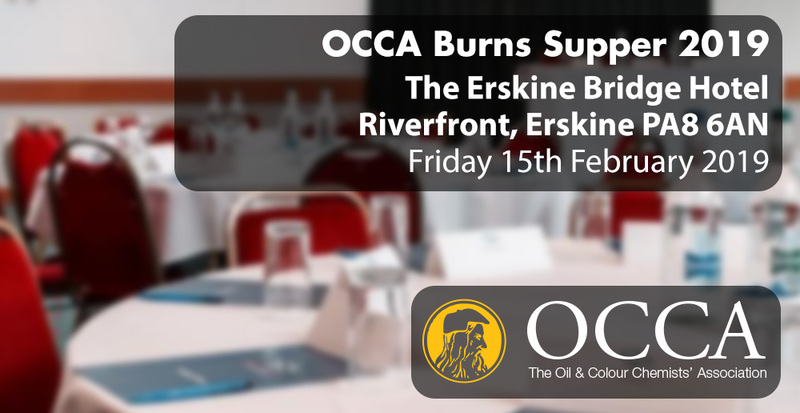 Reservations should be made as soon as possible to avoid disappointment, direct to the Erskine Bridge Hotel, (tel: 0141 812 0123; fax: 0141 812 7642), indicating that you are attending the OCCA Burns Supper, to get these preferential rates.